We've seen military heist movies before ranging from the likes of Three Kings to Broken Arrow. 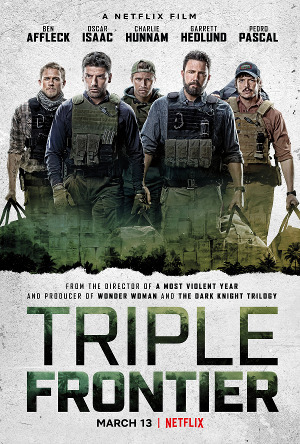 Unfortunately, Triple Frontier is more like the mixed success of the latter (although it lacks its crazy energy) even though you can almost feel its desperation to be compared to the former. And while the film is likely to earn comparisons to David O. Russell's 1999 film by some, they are hardly the same. The comparisons are marginal and incidental involving the basic set-up of the film and its ensemble cast. To put it simply, Triple Frontier is a B-Movie with an A-List cast that often gets in its own way celebrating the soldiers it turns into mercenaries. The movie stars Oscar Isaac as a former soldier now working in South America as a consultant for Colombian police struggling to take down a drug lord (Reynaldo Gallegos). Learning his target's location, and the fact that he's sitting on millions of dollars of drug money, Pope decides to enlist his old Army buddies (Ben Affleck, Charlie Hunnam, Garrett Hedlund, and Pedro Pascal) to head into the jungle, kill the target, and keep all the money for themselves. Although it kept my interest for most of the first-half of the film, eventually writer/director J.C. Chandor runs out of gas while it slowly limps to an obvious conclusion. I love heist movies, but when they play to type there are only two versions: the ones where the heist is successful and the ones where all the careful planning blows up in the thieves faces as things go increasingly wrong. Triple Frontier falls very much into the easy-bake cookie-cutter version of the second type making it all too easy to see where the movie will ultimately lead. Despite a talented cast, and some fair (though hardly memorable) performances from its stars, it's a movie that belongs on Netflix rather than theaters.